This is a post which took me 1 entire year to prepare - religiously sticking to the routine and tracking the results. Unlike the usual reviews, this review is actually a program prepared by Gary and John at Salon Vim for me to target my hair loss and hair growth. Last month in November officially marked ONE year of the treatment program and here I am documenting the process and results. I am the living testimonial to the effectiveness of this product and I have been spreading the good word about it through the very visible new hair growth on used-to-be bald patches on my crown and forehead. I find this a holy grail of all hair loss products because this indeed worked for me and what used to be a bald spot which ate at my confidence and self-esteem at events and there is no way I can hide the baldness (unlike in photos where there is always photoshop). It is now a furry overgrowth of soft hair. To heck with all other hair loss programs which I was always persuaded ferociously to purchase (but am smart enough not to). Densifique actually worked and you need not blow a five figure sum to reduce hair loss and increase hair growth. YOU CAN DO IT YOURSELF with the help of a good hair salon and stylist (who do not try to up-sell you things or products which will do no use to you and your scalp). My stylist is none other than John, therefore I can safely tell you that you are in good hands in his care like it was for me. Hair loss can be due to many many factors not limited to just stress, chemically-treated hair, poor diet, pregnancy, amongst others. At a point of time, I was seriously considering going for a hair implant because the baldness was getting worse by the months (probably due to work stress) and the amount of hair I dropped everyday in the bath is so much it can clog up the pipe. Yes it was extremely bad. If you had been one of John's customers, he would probably have shared my story with you because the hair loss I suffered daily shocked him too. Somewhere in this site many entries back, I have also mentioned before my photographers, Melvin and Fiona from Multifolds and Smittenpixels respectively have to digitally edit every single one of my photos for vgystore.com because the baldness shows up in full glory in the pictures and it is...shocking to see that bald spot on the head and definitely not aesthetically pleasing in photos. Which was why Gary and John advised me to try out this treatment program. This is NOT an advertorial, I am not paid for this nor am I sponsored to speak about it. John who attended to my hair for 12 whole months which is the entire duration of this treatment did so in his capacity as a trained Keratase hair therapist and I was not required to speak about this because it is (1) not a paid nor sponsored post and (2) I got on this program only because John convinced me to that it will definitely work and I just have to place my trust in him for 12 months. Within just 1 week of using Densifique every night after bath, hair loss was DRASTICALLY reduced. Since then, John started introducing this product to his customers who were experiencing hair loss because he genuinely believe in it too having seen the results on me. By the second month, I started to feel sharp new grown hairs on my scalp when I gently ran my fingers through my scalp. John who observed my scalp every night began to see (1) hair growing from used-to-be-dead follicles. Additionally, (2) the thickness of hair in each follicle has thicken and blacken with more than 1 strand of hair in each follicle. By the fourth month, I can see hair growth on my forehead (what!!!??) and just above my temples (where the bald spots are). My happiness for hair growth was short-lived as the new grown hairs (now visible, heavy and very short) were in the way during photoshoots haha. This is how we all live our life, don't we? We complain when we want something. And when we have it, we start complaining there is too much of it. Yikes! I shall let the photos do the talking because photos can never lie and I have two photographers (who used to heavily photoshopped my bald spots and have been with me since my bald days) who can vouch for my words here! These photo were taken 2.5 years back. It got worse with each passing month. My hair line was receding and my forehead especially was beginning to recede with the hair line getting lesser hair by the months due to hair loss. Look at the short hairs at my forehead which got into the way of my shoots and this time round, my photographer did not have to "ADD IN" hairs, they had to remove them to make it look more aesthetically pleasing for VGY fashion spread. It was also at this shoot when Fiona from Smittenpixels who was my photographer for the shoot asked me "Are you growing hair Tricia??? Omg they are at your forehead! It kept getting into the way can you please try to brush them aside?" IT BECAME A HAPPY PROBLEM! And even more photos which shows the obvious hair growth. By this time, the hair have grown out so much it got my friends asking how in the world did my bald spots and receding hair line seemed to suddenly have so much hair. The baby hairs from all over the crown of my head was also starting to grow out by then and it was all over the place which made me look very messy....80% of the time..with the baby hairs looking like flyaways. WHAT IS THIS TREATMENT ALL ABOUT AND HOW DOES IT WORK? 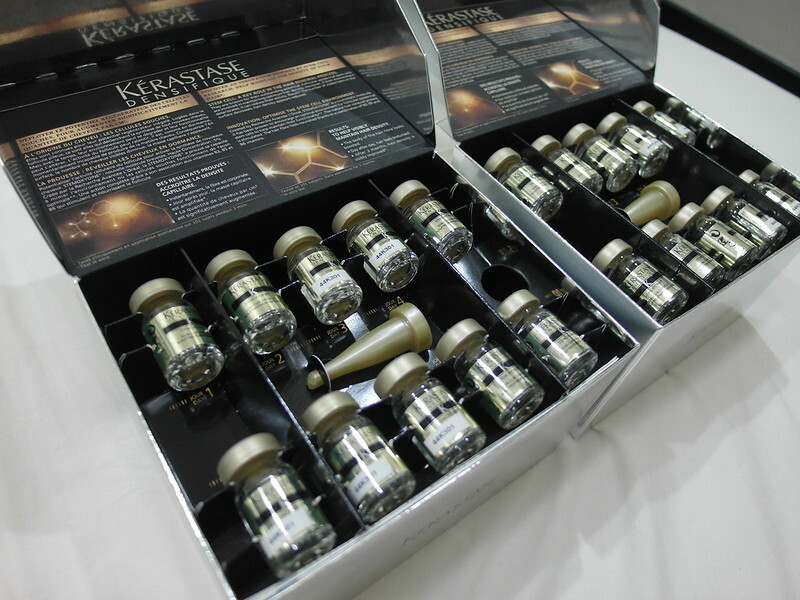 It is called the Scalp Atelier Treatment Program at Salon Vim with Keratase Densifique. 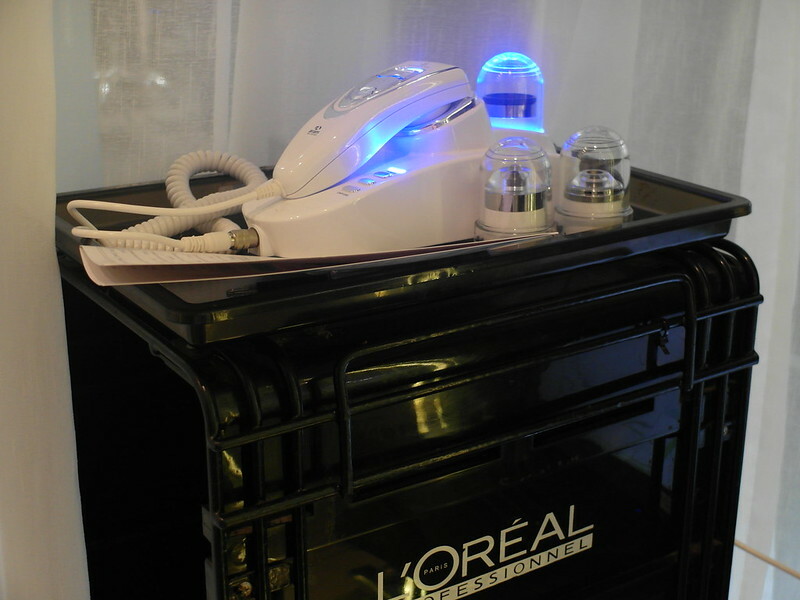 I started off with a scalp analysis at Salon Vim with John, who is a Keratase-trained hair therapist. In fact, he was the one who got me started on this program after he finished attending the courses for this treatment program, together with a handful of Salon Vim therapists. He was SOLD at the course and insisted I try out on this so...I became the first customer who took a leap of faith and tried this treatment out. John analysed my scalp periodically to show me the improvements over the months! My treatment program was structured along the way depending on the condition of my scalp. Thereafter, I was given periodic scalp treatments (which was included in my package) according to what my scalp requires from the analysis. This program address both short and long term issues. In my case, my short term issue is oily scalp which is why I require periodic trips to Salon Vim with John to treat my scalp. By treating my scalp first, it allowed my scalp to be in the optimum condition to receive the home care Densifique treatment which I will explain more below. The long term issue I was faced with was hair loss and inactive hair follicles. As with MOST people, the derma papilla on my scalp is in a "sleeping" mode and instead of 3 strands of hair in a healthy follicle, I only have 1 thin strand of hair. In addition to that, the distance of one hair follicle was very far away from another follicle - which resulted in very thin hair. So fret not if you have very little hair! In fact, all my family members have very little hair and both John and I initially thought it must be hereditary in my case but this is not true! Even if it is a hereditary problem, stem cells technology MAY BE ABLE to treat you just like it did for me! I never stop being amazed by this fact and have been spreading the word about this treatment program to many. Every trip made to Salon Vim for treatment on my scalp always had me leaving with a refreshed, clean and light scalp. The crux of targeting my short term problems which is an oily scalp is to ensure my follicles are in the optimum condition to receive the Densifique treatment and not hinder the growth process. 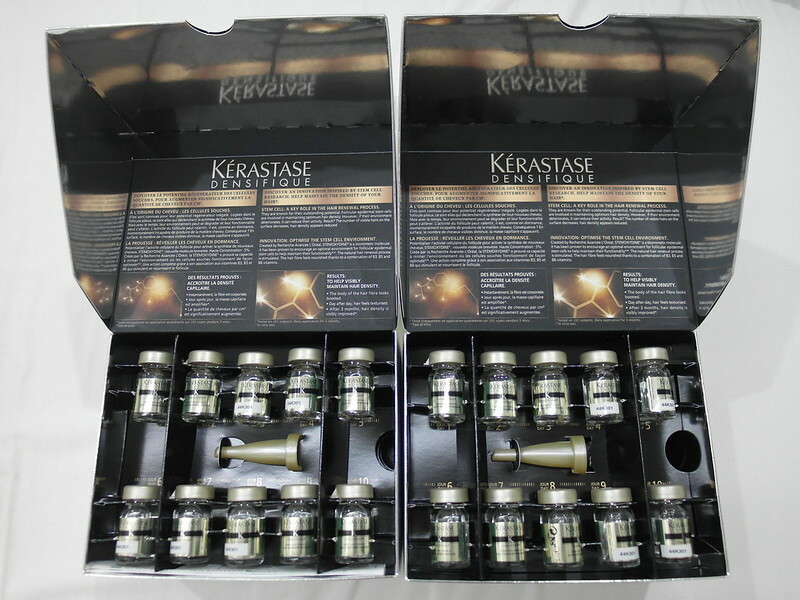 Granted you can simply buy off the shelf but it makes a huge difference with a treatment targeted at your short term issues which can encompass a large variety of problems such as flaky, sensitive scalp, dandruff, dry, irritated scalp - most of which are common problems faced by most Singaporeans because of our weather. 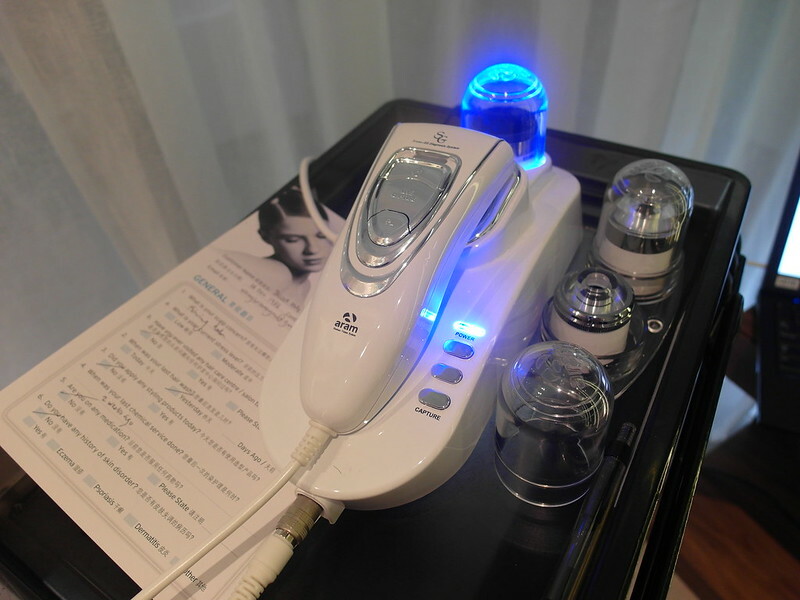 If I have not gone for the scalp analysis and have periodic scalp treatment with John, I could still be facing extreme hair loss and will not see results as quickly as I should be. If you realised from the photos above in the earlier part of this post, my parting was on the right. Did you also remember I mentioned I had hair loss on both sides of my forehead? But look at the hair growth when I part my hair to the left instead.. The hair growth is similar to the growth on the right side of my forehead. Back to the treatment, here comes the second part of this treatment program. 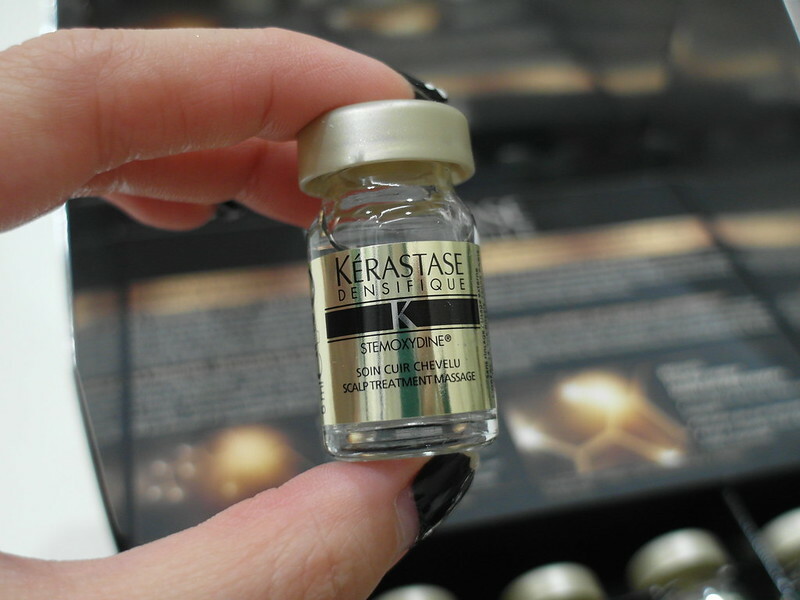 I was put on home care using Keratase Densifique. It is a breakthrough hair loss product containing a patented product known as STEMOXYDINE which is a molecule that works on stem cells to increase the density of the hair. I applied this daily every night after bath all over my scalp but most importantly on 3 key areas - both sides of my forehead and the receding line on my forehead. 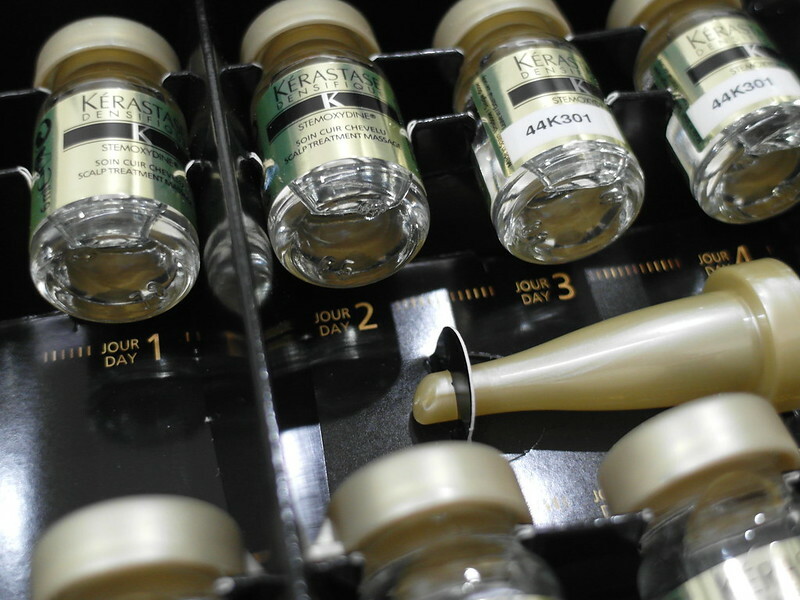 Over the course of 12 months, I finished using 3 boxes of Densifique (each containing 30 vials) and 1 box of Amenexil (containing 30 vials), in addition with periodic scalp treatments. So that is about it! 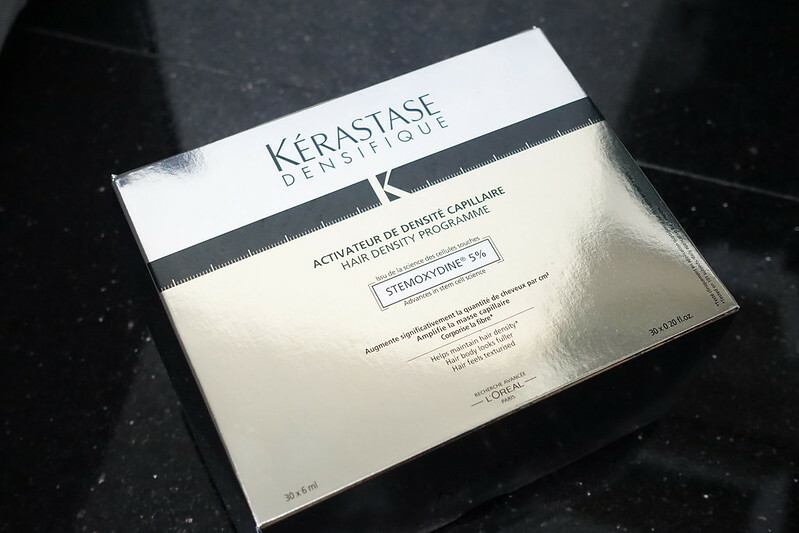 With results now, I have been getting lazy and no longer apply my 4th box of Densifique religiously BUT I do not see any reliance on this product as the "regrown" hair did not fall off when Densifique is not used. I can be really lazy and go up to 7 days without using it but I used to be very conscientious because the results were very encouraging haha. I guess I can partly attribute this non-reliance to the scalp treatments at Salon Vim thanks to my dearest John. I cannot imagine myself still suffering from hair loss and oily scalp. It would defeat all my efforts to apply Densifique every night when hair loss > hair growth. The Scalp Atelier Treatment Program with Keratase Densifique is only available at Salon Vim, located at 313 Somerset, #04-05. You can make an appointment and speak to my hair stylist, John Tham, about this if you wish to know more. Rest assured you can go for a non-obligatory consultation first and John is one hair stylist who will NOT BE PUSHY NOR HARDSELL you any products. You can go have a free consultation with him first where he can analyse your scalp and determine if you are a suitable candidate for this treatment.